Just released from Fantasy Flight comes Infiltration a card game of corporate larceny in a dystopian future . 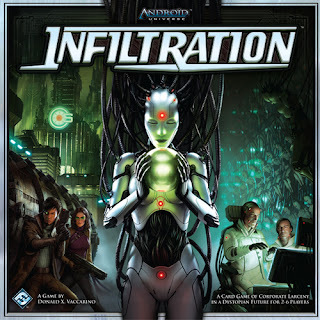 Infiltration has the variable game play we now expect from a Donald X. Vaccarino designed game (Dominion and Kingdom Builder). In Infiltration you take on the role of thieves that infiltrate CyberSolutions, Inc., a highly secure corporate facility to steal digital files. Your objective is to penetrate as deep as you can within the facility, moving from room to room collecting as much data as you can while outwitting your counterparts, and then to escape before the security mercs arrive. Each room contains specific elements that you can interact with, such as heavy machinery, locked compartments that can hold valuable data, and employees working after hours. Some effects can delay your movements or even wound you. All sorts of challenges await you. You can be assured, while inside security alarms will be triggered and the security mercs will come so you must decide how long to stay in and when to retreat and escape. The player who escapes CyberSolutions, Inc. with the most zettabytes of data wins the game. 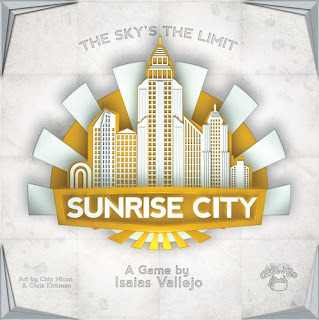 Sunrise City is the next offering from Clever Mojo Games, the makers of Alien Frontiers. This is a tile-laying game of strategic zoning, opportunistic bidding, and tactical construction. The game components are nicely done. The various tiles are thick and have colorful graphics depicting it's type. In Sunrise City, players select different character roles for each of the three rounds. You will create zones for development and bid for the right to control the zones. You will then construct buildings that can rise up floor by floor above the street level. Points are earned by clever zoning, careful bidding both smarter and higher than your opponents. May the best builder win. We have a demo copy of Sunrise City included in our Demo Library.